Do you have the ability to work in a very busy school office, enjoy working with children and in a community environment. Applications are invited from enthusiastic self motivated candidates to work as part of a team to ensure the smooth running of the Reception Office. Excellent interpersonal, organisational and communication skills along with the ability to use initiative and have a flexible approach are required. The post will include a wide range of clerical/administration duties including, reception duties, word processing, preparing excel spreadsheets, cash handling, processing Nursery admissions, managing the school diary and providing secretarial support to the headteacher. Experience of working in a school office and knowledge of CMIS software system is desirable but not essential. However, knowledge of Microsoft Word and Excel are essential. Good literacy and numeracy skills are required GCSE Grade A-C and the ability to work accurately and to tight deadlines. Hours of work will generally be starting at 8.30am and finishing at 3.30pm. Hours to be confirmed at interview. For more information and to download an Application form click on Vacancies from the Our School menu. This week, all the children are learning how to be Healthy Heroes and are exploring the different aspects of healthy lifestyles. Classes will be enjoying a range of activities and visits which will help them to develop healthy bodies, minds and attitudes. The activities which the children will enjoy include; sports and alternative ways to keep active, designing, tasting and making healthy foods and snacks, games and discussions about staying safe and circle time talks to address positive attitudes and emotional well-being. The week will be busy but fun-packed and allow the children to understand and lead happy and healthy lives inside the school gates and beyond. Tonight, nine Year six children played in their first mixed rounders tournament against New Oscott Primary School. We are very pleased to report that Whitehouse Common won 17 rounders to 12 and a half! We were extremely impressed with the childrens' teamwork, fielding and batting skills. Well done to the team and thank you to the parents for coming and supporting the children. A big thank you to all who helped with collecting the Tesco vouchers this year. We managed to collect 13247 vouchers, beating the amounted collected last year!!! We have decided to 'bank' the vouchers with Tesco so that next year we will have enough to order a large piece of ICT equipment, like a Macbook or Apple imac computer. Well done to everyone who helped us collect so many vouchers. 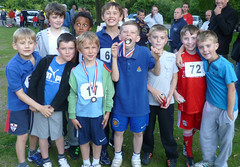 Tonight, the Birmingham Boys Brigade cross country competition was held in Sutton Park. You may recognise the boys in the photograph as members of Whitehouse Common, but they are also members of the 4th Sutton Coldfield Boys Brigade. Everyone of them represented themselves, their Brigade and their school brilliantly and, with their help, 4th Sutton Coldfield won the shield. Ethan and William also won medals for their individual placings. So well done to Luke, John, Jack, Matthew, Callum, Theo (who missed the photograph unfortunately) and William (Y4), Ethan (Y2) and Lewis, Cameron (Y6) and Joe (who would be in our Y6 if he hadn't moved out of the area) for all their efforts. Congratulations to Mr and Mrs Goode and Mr and Mrs Cleaver who got married on Sunday 29th May. Both the brides looked beautiful. The PTA are holding a 'Pamper Evening' on Friday 10th June. For more information please [click here]. On Wednesday 18th May, Whitehouse Common Primary School were thrilled to welcome visiting Headteachers from India. The visit was a great success and the celebrations were enjoyed by all. The children greeted the visitors by lining the path and waving UK and Indian flags that they had made. Children then performed an exciting programme of song and dance, which consisted of a variety of dances from India and the UK. Reception performed a traditional folk dance, Year One impressed us all with a Bolllwood style performance, Year Four tackled an impressive Bhangra routine and Year Six had our toes tapping with their Rock n’ Roll moves. The visitors were clearly impressed with the children’s behaviour and standards across the whole of our school and were ‘truly touched’ by the efforts of the children and the welcome they received. The visit was a continuation of our Global Links Partnership which Mrs Allen and another local Headteacher visited the Punjab in October last year to initiate links with ten schools in Birmingham. The aim of the partnership is that the schools learn about each other and our cultures and more importantly learn together about issues that affect all of us all. Children in our link school and here in Whitehouse Common have chosen to develop their knowledge of sustainability and looking after the world we live in. The children discussed what they wanted to gain from this opportunity and have enjoyed writing and receiving letters from the Punjab schools, sharing their knowledge and life experiences. During their week long stay in Birmingham, the visitors went to all ten schools involved in the partnership and also visited local places of interest, including, Lichfield Cathedral, the Bull Ring and Birmingham Metropolitan College. The visit culminated in lunch with the Lord Mayor and Lady Mayoress in Birmingham Town Hall. It is clear to see that our global links are now well established and we look forward to continuing to work with our link school in India well into the future.